I am not sure how I am writing this post as I thought I was all “draft-ed” out. However, I am going to blame Tennessee Smokies announcer Mick Gillispie for today’s post. Every Saturday at 11 am central, Mick co-hosts a radio show with Eric Cain called Baseball This Week on WNML Radio. 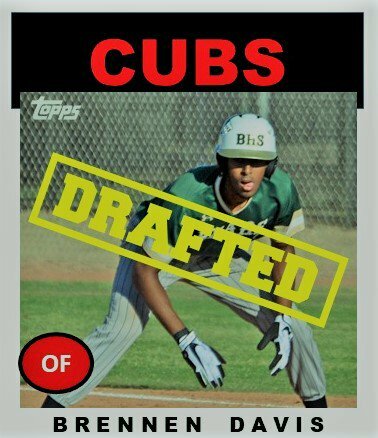 They discuss a panorama of baseball topics including the Cubs, the Smokies, and this last week, the MLB Draft. Their guest on Saturday the ninth was the Cubs’ national scouting crosschecker, Sam Hughes. Hughes talked about the Cubs’ recent draft and how the Cubs go about finding and selecting the players they do. Both Mick and Eric asked some specific questions about the process and what the scouts look for and investigate in a prospect. I will embed the show at the end of the post if you wish to listen to the excellent interview. To begin, Hughes talked about how elated he was that the Cubs selected top pick Nico Hoerner. He personally saw him three times down in Texas in the spring and 4-5 times last summer in the Cape Cod League. Hughes claimed that Hoerner is wired right and a “Cubs’ type of player.” According to Hughes, Hoerner comes to play, is athletic, should stay at shortstop, and loves that in talking to Hoerner, Nico mentions winning a lot. Hughes also compared Nico’s makeup to Kyle Schwarber. It was an interesting discussion between Mick, Eric, and Sam as they broke down how many times they check out a prospect and how makeup goes into making a selection. In addition to an interview and seeing the player in game action, Hughes told of how the Cubs do background and family checks. Another aspect that goes into selecting a Cub in the Theo Era is neuro scouting which predicts bat-to-ball skills. Theo used to brag about how high Mookie Betts scored on his neuro tests. This year, those highest scores went to second round pick Brennen Davis. Hughes described Davis as super athletic with an amazing presence and an engaging personality. The final three guys Hughes talked about also detailed on why they were picked. Pitcher Paul Richan (Compensation round) was taken for his ability to throw strikes. 2B Andy Weber (5th round) from Virginia was taken as a hitter who has good bat-to-ball skills. Pitcher Ethan Roberts (4th round) flashed an amazing curve and cutter in his work this past weekend in the College World Series. Hughes thinks Roberts’ stuff will play up like Dakota Mekkes’ stuff has done as a pro. That’s a pretty cool comp. And again, Hughes praised the Cubs R&D staff for all the pitch data on Roberts, who could be an elite arm. Mick and Eric would go on to have a great conversation for the rest of the hour as they talked about the Cubs. I really enjoyed the interview as both Mick and Eric were able to draw out how the Cubs go about scouting, analyzing, and selecting the players they do. Over the next few days, many of this year’s draft class will report for their physicals out in Mesa and then sign their contracts. With Mesa and Eugene starting play on Friday, some of them will begin their pro careers quickly. If you want to keep up on the signings, I suggest you follow @Savermetrics on Twitter. He has some great info on all the draft picks. ‹ PreviousProspect Update – Is Duane Underwood Close? Next ›What Cubs’ MiLB Position Is the Strongest?